The Skinny: A near-perfect Ringo Lam film, possessing of a deceptive simplicity that hides greater depths beneath it's uncluttered narrative. Lau Ching-Wan and Francis Ng are both excellent. 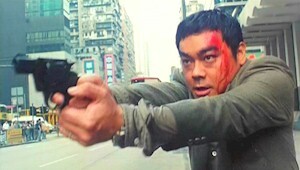 Ringo Lam returns to Hong Kong after the tepid Maximum Risk with this top-notch cops ‘n robbers thriller. Lau Ching-Wan is Officer Pao, a stressed cop who investigates a routine murder. The culprit is a loser named Mak Kwan (Francis Ng), who admits to manslaughter, but not the more serious crimes that he’s planning with a mainland criminal (Jack Gao). Problem is, Lau and his crew (Chin Kar-Lok, Emily Kwan, and Peter Yung) are on to Mak Kwan thanks to the handy bomb-making materials discovered during the investigation. This leads to an elaborate stakeout as the cops try to discover just exactly what Mak Kwan is up to.